Think ants on a log, only better. 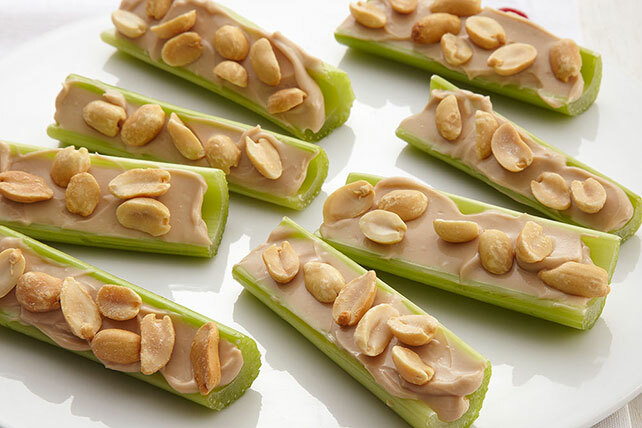 We smeared celery sticks with brown sugar-sweetened Neufchatel cheese and topped 'em with peanuts. Inspired? We think so. Mix Neufchatel and sugar until blended. Spread into hollow sides of celery; top with nuts. Cut each into 4 pieces. Spoon Neufchatel mixture into resealable plastic bag. Cut one corner off bottom of bag; use to squeeze Neufchatel mixture into celery as directed. Prepare using PHILADELPHIA Cream Cheese and chopped PLANTERS Pecans.